Swoon is easily one of the most interesting street artists to emerge during the last ten years. She may lack the mystery of someone like Banksy or the mainstream notoriety of a Shepard Fairey, but her work is so strikingly human that it speaks to the soul. From her wheat pasted figures that have graced walls worldwide to a floating armada of hand made rafts, SWOON is a stunning look back at her first decade of art. Swoon is the person who sleeps two hours at a time and prints in the middle of the night in bare feet. She is tall tales and Internet chatter. Hr name came out of a dream. We call her Callie because we love her. Swoon belongs to everyone. Callie is for us. Considering the connection that she makes with people, it is no surprise that she works with such a large community. Rollo Romig recalls his all night antics with the Toyshop Collective (such as replacing subway ads with art), a group whose membership was "open and fluid" as long as someone could "devote endless hours to making impermanent things and not be afraid of looking ridiculous". 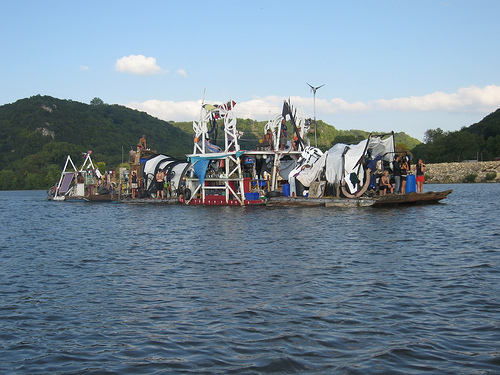 The Toyshop Collective (only named for grant purposes) thrived in bringing together people; in 2003 they staged a pirate takeover of Staten Island that drew hundreds of swashbucklers. Throughout the book it is apparent that Swoon is someone that brings people together; a gatherer of souls. The beauty was unimaginable...The way that in every town someone called the cops, and someone brought us dinner, and someone said we had changed their lives. Someone offered their daughter, and someone made sure their daughter got nowhere near us...We lost sight of half the ideals we left with and unearthed all sorts of values we weren't expecting to find in the beautiful, old Midwest. Swoon is a wonderful look at an artist told from both her perspective and that of her true peers, rather that some curator or art historian. Rather than spend endless pages over-analyzing pieces of art for message or subtext, this book presents stories that give a true insight as to both the artist and the person. 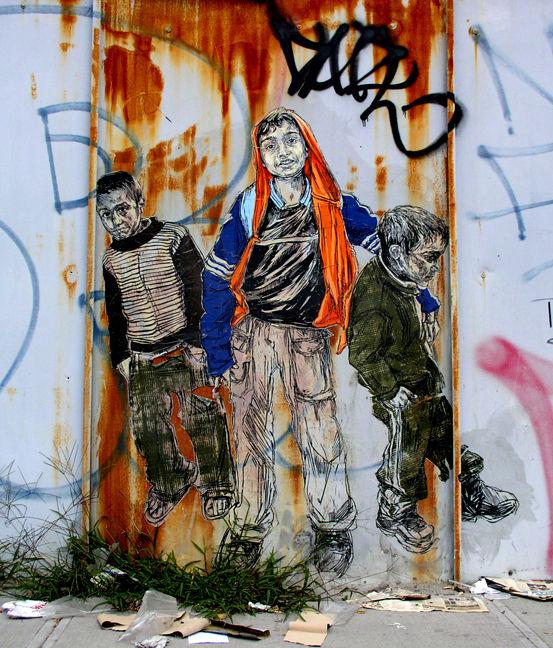 The art piece "Bethlehem Boys" is very unique, it contains a measure of reality while keeping a caricature feel. It would be something that might require me to slow down in order to observe if I were walking by. The vivid colors against the wall also help bring attention in comparison to its surroundings. I absolutely must have this book. I remember the first time I saw one of her pieces was when I was visiting different galleries in Chelsea as a wee freshman going to school in New York. I didn't know it was her work until years later; (This was the piece I saw: http://a8.sphotos.ak.fbcdn.net/hphotos-ak-snc3/22035_1365019644943_1215180004_31091755_5549815_n.jpg). I want to learn more about Miss Rockaway Armada since it's so different from her wheatpasted images. Thanks for sharing! This book review was really interesting! Because of this review i am really intrigued and it makes me want to read this book. It looks like the pictures in there will be awesome. And i really liked that you focused a little on the floating trash boat! That is wayyy cool to see and hear what Swoon had to say about the experience! Good job!